When a road trip that should take three hours one way ends up taking 11 hours, you know the stars are aligned for a story that you'll be able to tell for the rest of your life. Not Me, it's Steve Martin. For me, that happened during a recent visit to Chicago for a big diabetes conference in mid-June. My return trip home via Amtrak got a little crazy, and turned into my own version of the movie Planes, Trains & Automobiles. 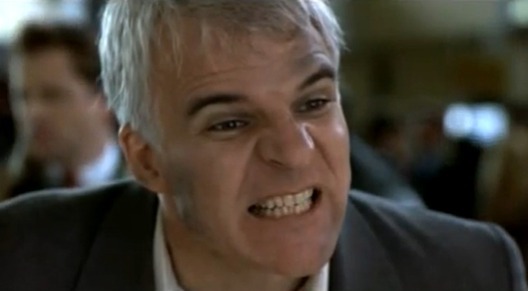 Except that I wasn't as frustrated as Steve Martin was at the rental car counter, demanding a "f*ing car right f*ing now." And there were no planes, but there were plenty of stories coming from the trains, taxis, shuttles and buses that carted me around during those five days. Now, keep in mind that this was my first train trip EVER. 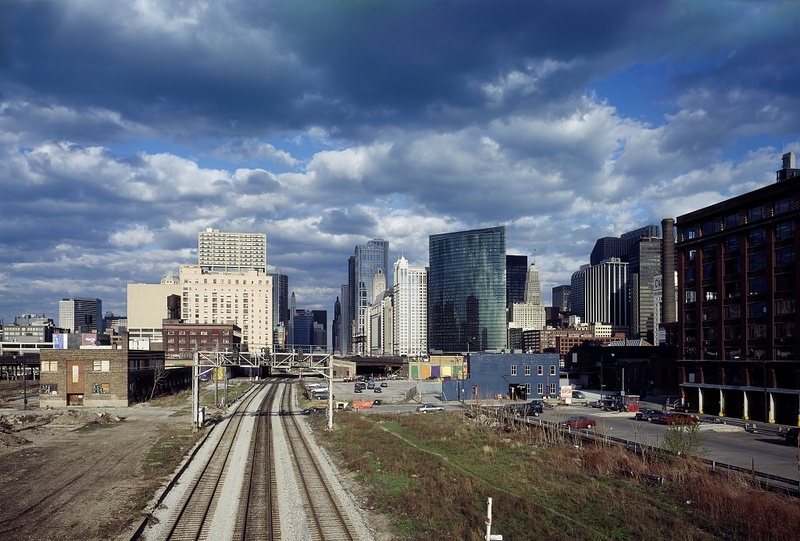 It helped not have to worry about high parking costs in Chi-town, and made for many shuttle and taxi rides in the city -- book-ended by my Amtrak travels to and from the Windy City. The train ride from Indy to Chicago five days earlier had been pretty smooth and uneventful, except for a minor delay thanks to a long freight train crossing our tracks at one point. But the way home, was a different story. 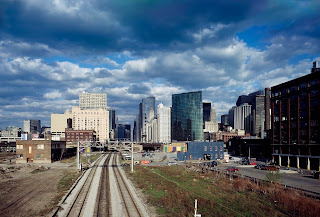 My taxi ride from hotel to Union Station in Chicago was short and cheap, though I did fear for my life after a thug-looking character gave me the evil eye when we both needed a cap (the second time that trip something like this had happened). But, all turned out OK and off to the train station I went an hour before departure. Departing on a Monday, my train was set to leave Chicago's Union State at 5:45 p.m. -- and that we did, right on time. But a storm was moving in to the area, and within a few miles, the sky darkened and heavy rain and hail started pounding the western-facing side of the train. Yes, it became a purple-prose classic Dark N Stormy Night, except this wasn't a literary work of fiction... No, instead it was the whole reason for my 11-hour trip home. About 15 miles south of Chicago, the first delay derailed our plans (but not the train!) to get home without a hitch. ... For about 10 miles. Then, we stopped again. This time, they KNEW power lines had fallen on the tracks ahead and they had to bring in a track inspector to assess the situation and tell us what could happen next. There we sat, as the evening dusk grew darker - and we didn't move for 4 hours. By that time, I would've almost been home, had everything been going according to plan. We heard gradual updates, basically telling us that there was no update. And of course, I was stuck on a ride that had no dining car. And I was thirsty. And worried that my blood sugars might go Low. I had nothing, even fast-acting glucose, on me because I'd given it away to fellow D-Peeps at the conference. It annoys me that Amtrak doesn't offer a dining car sometimes, especially in those emergency situations. I think they should ALWAYS have that as an option, just in case. But I digress. Luckily, I met a nice family also traveling to Indy who saw me testing my blood sugar, and started up a conversation about it. And when I griped (with a laugh) about not having anything, they offered some Twizzlers in the event I needed them. So, there was that! We laughed about the situation and kept a sense of humor about all of it, although we were tired and annoyed and just wanted to get home. A couple people were off their rocker frustrated, and seemed to be imitating Steve Martin... to no avail. There was nothing Amtrak could do. Eventually, about 10:30 p.m., we were told that a decision had been made to put us on buses - those going to northern Indiana would be on one, those of us going to Indy would be on another. Why did it take so long to decide this? Well, apparently the track inspector was doing his thing for a long time... but at some point lost his flashlight (WTF!?!) and couldn't continue the inspection. So we were SOL and had to find an alternative, or stay on the non-sleeper available train all night. The first bus arrived within 30 minutes, to the dark muddy field where the train tracks ran through -- next to another line that was apparently OK, since we saw several trains go by in both directions during those several hours. As if we were being laughed at by the Train Gods. About two hours after the train conductor's announcement we would all be moved to buses, our 2nd bus arrived alongside the stuck train. Apparently, this driver couldn't figure out how to get to us in the darkened field, which was about a half-mile from a train crossing (that the conductor had suggested moving us closer to at one point). It was after midnight, and we were tired and more frustrated. But we made the move. Now, it was a muddy field and I darned near slipped in the mud getting off the train and heading toward the bus. But I managed to stay on my feet, even though my suitcase got a little mud-covered. We were 25 miles outside of Chicago (so my iPad map's blue dot told me), but at least were were ready to finish the trip within a few hours. I ended up on the back of the bus, which was about 80% full with about 50 people aboard. We got a snack pack when sitting on the bus, but the Chicago area guy had to "get home to walk his dog" so he didn't stay to hand out water to the thirsty group. I went up to the front, asked who was thirsty and handed out some water bottles to those with raised hands. Before we suddenly pulled over off the side of a highway, while the bus driver left the bus without a word and left us sitting in the dark, clueless. All I could hear was clunking around outside toward the back of the bus, but couldn't see the driver anywhere. That's when I saw it. A fog of smoke billowing from the back of the bus outside. "Oh, that's great!" I said, seeing it first and alerting others to the apparent issue. "We're never getting back," another passenger said. Ten minutes later, the bus driver returned. Without a word, he started the bus and we pulled back onto the highway. He ignored a couple questions from the curious passengers. At the first exit he saw, the bus took a detour and made its way to a fuel station with a McDonald's. clueless, so I got up and went to the front - where the Twizzler-containing family told us the bus driver had to "put oil in the bus," and so we could "help ourselves" with any food or bathroom breaks needed inside. As frustrating as it all was, I couldn't help but laugh. Several of us contemplated hailing cabs and just going that route, but we envisioned something else happening, so we'd better just stick with this bungled adventure. At least we had stories to tell. I went inside and got an iced coffee (of course! ), then stood outside watching the bus driver put oil into the back of the still-smoking bus. On Twitter, I had been updating everyone on the travel situation since leaving Chicago. One person asked after the "bus billowing smoke" Tweet if this was really happening. So, I snapped some photos. After almost an hour since we'd first boarded the bus, we finally got moving and it seemed as though this could be the time we finally had smooth sailing (or driving, or whatever). We were skeptical, but it ended up being an uneventful trip the rest of the way. I got an hour of scattered sleep, did some writing on my Keyboard-connected iPad, and listened to some Spotify music while occasionally glancing up to make sure all was still progressing. The trip took us back to the circle expressway around Indy just about 4:30 a.m. -- eleven hours after we'd left. Of course, we had to drive downtown to Union Station and the bus ended up a little bit further from the train stop, and so it was about 5:30 after my wife arrived on the scene to get me. Front of Union Station in Indy. We went to breakfast, before she journeyed off to work and I went to catch a few hours of sleep in my own bed before starting a long and very busy day in the home office. In the end, despite ALL THE DELAYS, it wasn't a bad experience. 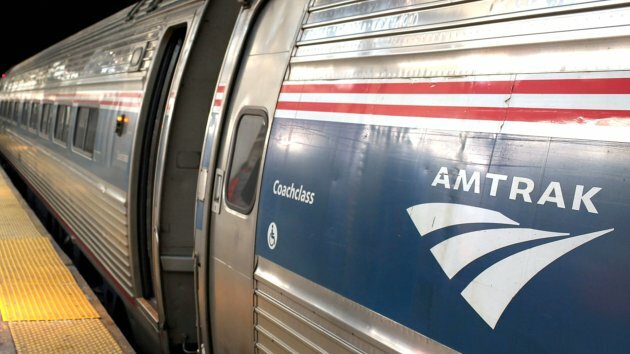 Sure, Amtrak could have an "emergency dining car" option (with booze, please! 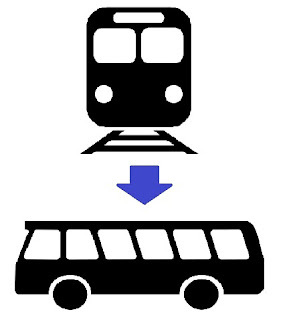 ), the track inspectors could carry spare flashlights and the bus drivers could be a little more helpful. But for the very low cost of the whole trip, and the sense of humor most were able to keep, it was somewhat of an entertaining adventure home. I wouldn't want a sequel to my last traveling experience. Wow -- sounds like a hell of a trip! Unfortunately, that's not uncommon for Amtrak. Other than the Northeast Corridor, which operates over high-traffic commuter-routes from DC to Boston (with schedules and everything! ), most of Amtrak runs over tracks owned by the freight railroads. Unfortunately, this means that the freights always get priority, and the passengers may sometimes have to wait for them to pass. It also means that when maintenance has to be done on the tracks, the freight company has to send someone out, and they have little motivation to help the commuter rail. As for the bus -- well, if you frantically try to find a bus that's not in service to carry passengers during a hailstorm on a nontraditional route, your choices are slim, and there's probably a reason the one you find is available. I know the rationalization doesn't make things better, but it may help to understand.